Water quality monitoring system for analyzing pH, conductivity, dissolved oxygen, salinity, TDS, seawater specific gravity, turbidity, depth, ORP, and temperature. The U-22XD water quality monitoring system brings laboratory accuracy and the ease of push-button operation to water quality measurement in the field. 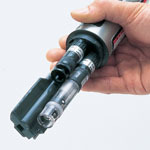 Years of water quality analyzer technology development have resulted in the form of a 47-mm diameter water quality analyzer probe: a compact water quality monitoring system offering high pressure tolerance, long-term continuous measurement capability and highly accurate, simultaneous analysis of 10 parameters. The water quality analyzer can simultaneously measure: pH, temperature, dissolved oxygen, conductivity, salinity, turbidity, total dissolved solids (TDS), water depth, oxidation reduction potential (ORP), and seawater specific gravity. Featuring a powerful water quality analyzer and state-of-the-art functions, the water quality analyzer makes it easy to get highly reliable water quality data simply and quickly just by submersing the sensor in the water. The water quality monitoring system is flexible enough to use for checking the quality of a broad range of water samples, from factory effluent to urban drainage, river water, lake and marsh water, aquatic culture tanks, agricultral water supplies, and sea water. The main unit is water resistant, so it can be used safely even in the rain. The U-22XD water quality monitoring system has an automatic calibration function that calibrates the instrument simply at the touch of a button for more highly reliable data. What used to be a complicated calibration process is now easy. Just fill the supplied beaker with the standard solution, immerse the water quality analyzer and press a button once for one-point calibration for each of the five main parameters pH, conductivity, turbidity, DO, and depth. Two-point calibration is also possible where high precision measurement data is required. With its superior durability and high pressure resistance, the water quality monitoring system facilitates measurements as far as 100 meters below the water surface. Thus, in addition to rivers, lakes and other shallow bodies, high-precision water quality measurements can now be readily obtained and monitored by the water quality analyzer at dams, and even in the open sea. The water quality monitoring system's built-in memory function enables continuous measurement for as long as one month, just by leaving the probe submerged in the sample. Personnel need not to be present during the measurement process, the data can even be captured by personal computers in remote locations. NOTE: Must purchase U-PCDLP to export data to a computer. 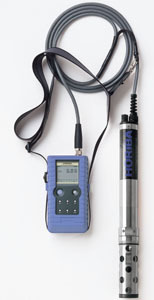 Water quality monitoring system includes 2 m cable. Note: Cable is not detachable. Water quality monitoring system includes 10 m cable. Note: Cable is not detachable. Water quality monitoring system includes 30 m cable. Note: Cable is not detachable. Water quality monitoring system includes 2 m cable. Note: Cable, meter, and probe are detachable. Water quality monitoring system includes 10 m cable. Note: Cable, meter, and probe are detachable. Water quality monitoring system includes 30 m cable. Note: Cable, meter, and probe are detachable. Water quality monitoring system includes 100 m cable. Note: Cable, meter, and probe are detachable. Includes U-2001 extension unit, AC adapter (specify voltage 110 or 220VDC), and a RS232C cable. NOTE: This package is required to download data from the Water Quality Multi-probe to a computer. Measures pH, dissolved oxygen, temperature, turbidity, salinity, and conductivity.